In the first part of this article, I wrote of two genuinely innovative developments in cable technology: The first was A.J. Van den Hul's use, even as far back as 1993, of specially-fabricated non-metallic carbon conductors to replace all of the wire in his interconnects and other cables, and the second was Knut Skogrand's inclusion of balsa wood in the dielectrics of his cables to lower their overall dielectric constant and, consequently, their stored energy. Both of these were, I said, unique solutions to specific cable signal transmission issues, and both have been claimed by their designers to represent real progress toward perfect cable function. Even so, I said, "...there still remain a number of unresolved cable issues that could (although it has not yet been conclusively proven) affect cable performance and sound quality", and I promised to tell you about one of them and even suggest a truly innovative solution in this second half of the article. One of the more interesting problems facing cable designers is the issue of Velocity Factor ("VF") or velocity of propagation ("Vp") -- the speed at which signal passes through a medium (in this case, a wire or cable), stated as a percentage of the speed of light. It has long been known that if we were to take two identical lengths of the same wire off the same spool and jacket them both with different insulating materials (dielectrics) and test them, we would find that each had a different velocity of propagation. That can only mean that passage through them has affected the signal, and we can only hope that there have been no negative consequences. Obviously, with both test samples being identical wire, of identical length and therefore of identical resistance, whatever caused the differences in Vp must have something to do with the insulation and NOT with the wire. That simple fact has caused serious conjecture among physicists about how signal is transmitted, with the easiest conclusion (and the one dictated by Occam's razor) being that it's not the wire at all, but the insulation that's actually carrying the signal, and this has been proposed by some researchers. The problem, of course, is that the insulation is INSULATION, and is - or at least is conventionally believed to be - non-conductive. If that's true, how can it be that a non-conductor is what's conducting the signal? Other possibilities that have been proposed are that the signal is not carried in EITHER the wire OR the insulation, but in an electrical field surrounding and influenced by the dielectric. Even Wikipedia (See "Velocity factor") says that "VF equals the reciprocal of the square root of the dielectric constant (relative permittivity), \kappa, of the material through which the signal passes:"
So either way, it's the dielectric constant ("K") of the dielectric, and NOT the wire that determines the velocity of propagation for an insulated wire, and the conductivity (the inverse of "resistance") of the wire has nothing to do with it. The idea that it's the electrical field that's carrying the signal also means that it's NOT the movement of the electrons that's doing it, which, in turn, explains how it could be possible for a non-conductor (the dielectric) to be the thing that's actually carrying the signal. Now, to that astounding (at least to me) discovery, let's add one more proven fact of cable behavior: Inductance (the "L" of the often-heard "L, C, R" explanation of how cables work). When any current is passed through any conductive wire, an electromagnetic field is known to form around that wire, and when - either upon turning off a DC current or upon the reversal of polarity of an AC (possibly "music") current (a "signal") - that field collapses, a new current flow is known to be induced in that wire (as "self-inductance") or in other wires within its collapsing field (as "mutual inductance"). 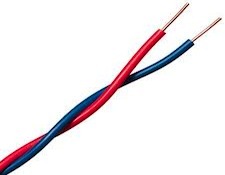 The use of non-conductive wires could eliminate these potentially-disruptive current flows entirely and, now that we know that the wire is not actually needed for carrying the signal, such non-conductive wires can be seen to be physically possible. All we need now is for someone to complete the research and to bring out a line of non-conductive cables - perhaps even using balsa wood leads, ala Skogrand - as their medium of transmission. Knut Skogrand might, in fact, be just the man to do it, as might A.J. Van den Hul. I doubt, though, that either of them would be interested: Both have already built their reputations, and aren't likely to risk them on a project so far from any accepted norm. Maybe a better choice would be Peter Belt or even Dr. Lirpa. Whoever does it, though, let's get it done. Especially in terms of making black backgrounds even blacker and improving the quality of the silences between the notes of our favorite tunes, non-conducting cables could be a big step forward, and could even make Hip-Hop sound better!